It's that time of year. Tons of family and friends are going to be getting together over the next couple of weeks to enjoy one another's company. 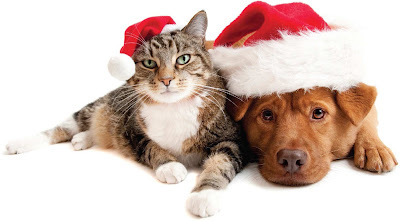 The holiday season is known to be a time of excess but what most Canadians/Americans don't know is how it can affect the family pet. Delicious food (so much temptation), great parties (extra hands to slip a little "treat" from the appetizer table) and time to laze around on snowy afternoons don't only affect the two-legged members of the family. I know for us it's hard to host a party with our Boston Terrier, Izzie, because not all people like dogs and I know that our dog is very hyper and runs around a lot when we have people over. So during this time of year when we have people visiting or over for a dinner and/or party I try and make sure to feed her before they come. And I make sure she goes potty because she has a weak bladder and gets excited very easily. DO: Leave a cute festive note on food tables reminding guests not to share people food with the four legged guests. DON'T: Leave food and drinks on a low table during the party. DO: Give your pets an early dinner to keep them full during the party and less likely to beg for snacks from your guests. Disclosure: All opinions are my own. I received coupons for Petcurean pet food for the purpose of this post. No other compensation was received. kids party entertainment Entertainment Emporium will thrill the littlies with their range of ideas. Who knows – one day your child could be a pop superstar, maybe even win The X Factor, thanks to the inspiration they got at a disco party for kids. I learned a new tips from your article regarding about dogs. This is the exact blog, I'm looking for because me and my wife is planning to buy a dog in a pet shop. I will show this one to her and I'm sure she will love your article. I wish you would also post an article about vets swale. Thank you for sharing this information with us.